The AMTRA SQP prize winners were revealed during the SQP industry awards ceremony at the AHDA dinner, taking place alongside AHDA’s annual conference at the Hilton Metropole Hotel at Birmingham’s NEC. 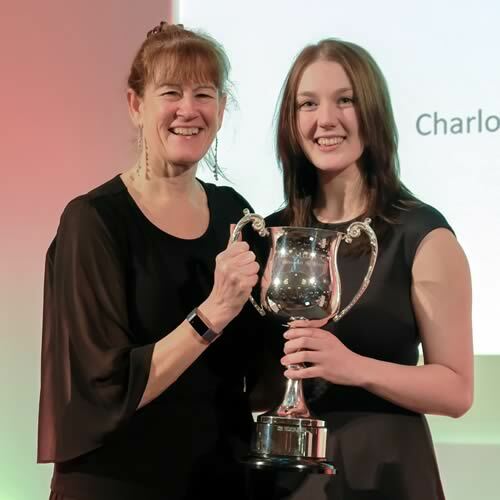 Charlotte Walton of Carrs Billington receives the AHDA Cup for the best overall student from Gaynor Hillier of sponsors Elanco. Collecting the Simon Fleet Cup and a cheque for £300, Charlotte Walton has been recognised as the top R-SQP, covering all species. Having been brought up on the family farm in Cumbria, primarily a beef and lamb unit, Charlotte developed her strong affinity with farming and animals which now forms the basis of her professional career. Charlotte has been at Carrs Billington since June 2015, initially as an admin and retail assistant. Recognising her dedication and enthusiasm, Charlotte’s employers saw the mutual benefit in her undertaking AMTRA training and by May 2016 Charlotte began studying at Harper Adams University. By the first week in July she had taken her examinations and today she is currently undertaking the Gold Standard which she hopes to complete by spring. “Even before I qualified I would attend many of the CPD events. They are so engaging and there is much that you can bring into your own practice,” explains Charlotte. Charlotte enjoyed a double celebration as she was also named the winner of the AHDA Cup, sponsored by Elanco for the best overall student. She had earlier been presented with the R-SQP prize by Andrew Wylie of sponsors Zoetis. Lyndsey Mann of Charlies Stores Ltd in Coed y Dinas, Welshpool received the Battles Cup and a cheque for £150 as the winner of the best equine SQP award. A country-girl at heart, Lyndsey has managed various yards after taking her HND in equine science, before injury took its toll and she looked at a new career in retail with Charlies Stores. “When my current employers put the offer to become an SQP to me, it seemed a no-brainer,” says Lyndsey. “I feel that educating people is really important, especially in the equine industry as it is really scary how little the majority of horse owners know about endoparasites and the correct wormer to use, and when!” she continues. Lyndsey was presented with her award by Jim Bowen of sponsors Battles. The winner of the AMTRA Cup for best companion animal SQP is Clair Thomas of the Oak Veterinary Group. Operating mainly from Oak Vets’ Haverfordwest surgery, Clair joined the client care department in the summer of 2013 as an additional member of the reception team. She now plays an integral role and enjoys being part of the process which 'helps make pets better'. Unfortunately Clair was unable to attend the event and the award was accepted on her behalf by Findlay MacBean, head of large animal business at sponsors Merial. Clair also receives a cheque for £300. “I would like to congratulate Charlotte, Lyndsey and Clair. We are delighted to recognise the achievements of these three outstanding students. It is testament to their dedication and hard-work and really reflects the commitment that we see across of all of the SQP students on our courses.” says Stephen Dawson, AMTRA’s secretary general. “They join almost 7,000 SQPs working across the equine, farming and companion animal sectors. These qualified professionals offer free and impartial advice on issues such as resistance, responsible use of wormers and other medicines, and general animal health and welfare. “Through their professional advice on responsible use, SQPs support industry-wide efforts to keep animal medicines effective into the future,” concludes Mr Dawson.